Rallies are planned at dozens of cities all over the world in support of Bradley Manning - the US army intelligence analyst who leaked intelligence to Wikileaks - whose trial begins on Monday. 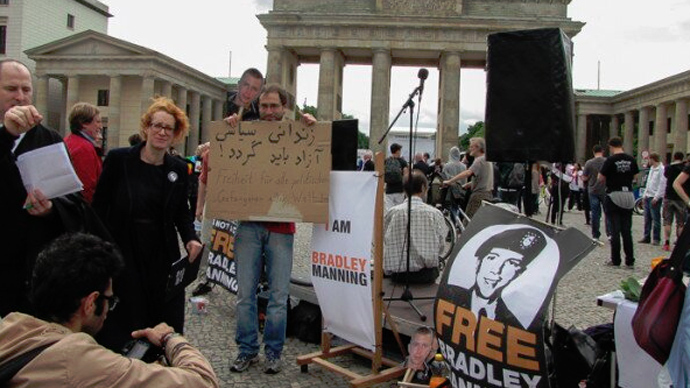 22:00 GMT: The Fort Meade event for Bradley Manning has come to an end, after a day of rallying in major cities around the world. 19:20 GMT: Daniel Ellsberg, a former Vietnam whistle blower who leaked Pentagon papers to the press, is supporting Manning and the protests. Earlier this month he said in statement "history is on the side of those who seek to reveal the truth, not on the side of those who seek to conceal it." 19:15 GMT: Manning supporters are hanging Nobel Peace prizes on the fence next to the Meade demonstrations. 19:05 GMT: Manning has decided not to have his case heard by a jury. This has led to speculation that his lawyers believe a military jury would not be sympathetic to someone many regard as a traitor. PJ Crowley a State Department spokesman who was forced to resign following the military's alleged harsh treatment of Manning while in custody said "A private first class does not get to decide whether a conversation between a high-level US official and the King of a Gulf nation should be made public." 19:00 GMT: Two of America's best known champions of the First Amendment right to freedom of speech, Floyd Abrams and Yochai Benkler, wrote that if this assertion was to be accepted then no media outlet could safely publish leaked material. 18:58 GMT: Protesters at Forte Meade are shouting 'We are all Bradley Manning'! 18:45 GMT: Over 3000 protesters are now at Forte Meade with Code Pink putting up a strong showing. 1830 GMT: The prosecution in the Manning Case is arguing that because he leaked material to Wikileaks, which he would have known could be read by Al-Qaeda, he was in effect communicating with the enemy. 18:15 GMT: Manning has denied the more serious charges under the Espionage Act for which he would be imprisoned for life. The prosecution has said it will not pursue the death penalty. 18:00 GMT: Manning has pleaded guilty to 10 of 22 charges in relation to information he passed on to Wikileaks and faces up to 20 years in prison. 17:50 GMT: Anonymous, the group of hacktivists, has announced a twitterstorm for Manning to get higher trends for the cause. The hashtag #FreeBrad is proposed. 17:30 GMT: Crowd funded stenographers who were set to create daily trial transcripts of the trial have been denied press passes to the court martial. The Freedom of the Press Foundation has hired one citing the military's limits on access to the proceedings viewed as one of the most important trials in 40 years. Crowd-funded Stenographers Denied Press Passes to the Bradley #Manning Court Martial @ @freedomofpresst.co/0WyPE. 17:25 GMT: The number of protesters grows at Fort Meade where the trial is beginning Monday. 17:22 GMT: Protests get underway in Paris. 17:00 GMT: Protesters gather in Maryland, USA. 16:40 GMT: Twitter users brand Manning's trial a 'show trial'. 16:35 GMT: British activists Peter Tatchell and Vivienne Westwood were out at a demonstration in London today in support of Bradley Manning. While UK comedian Russell Brand has urged people to learn about and support Bradley Manning. 16:30 GMT: The Fort Meade military base in Baltimore where the trial will take place is preparing for hundreds of people as part of the Bradley Manning demonstration. Many roads in the area will be closed or restricted.